St. Johns Center for Opportunity provides fiscal sponsorship to groups who closely align with our mission and strategic goals. 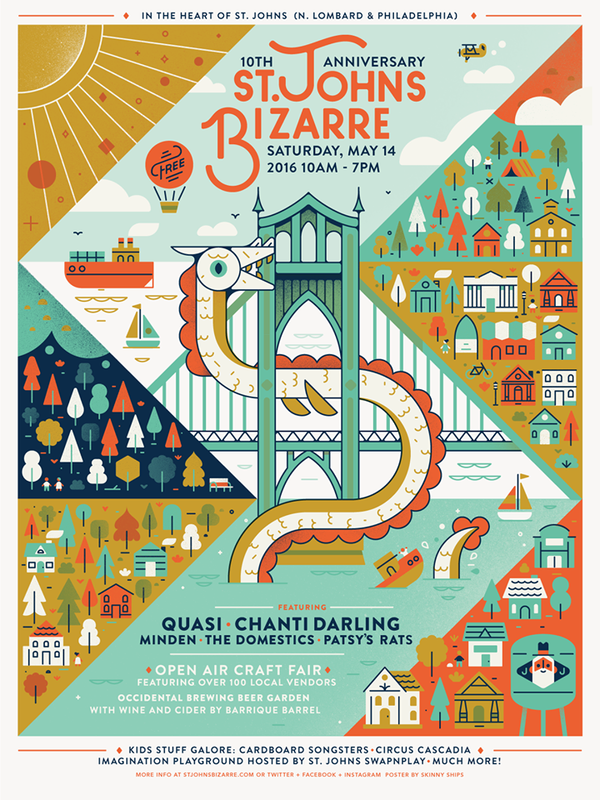 The St Johns Bizarre is a uniquely-crafted celebration that kicks off the summer street fair season in Portland. Held annually on the second Saturday in May, the Bizarre brings music, crafts, and food to the crowds attending the St Johns Parade, now in its 54th year. After the parade, the entire six block area of the business district in the St. Johns is closed to traffic, and filled with over 70 juried craft vendors, several stages for music, great food, and tons of games and activities. It’s an amazing community event with something for everyone. The event is free. The Bizarre is coordinated by a large group of volunteers, all St Johns residents who work with local businesses and the community to make the event happen.We rely on the support of local businesses, community partners, and event sponsors, without which the event would not be possible. There are always opportunities to get involved. The St. Johns History Museum is an all volunteer run organization that is working to create an accessible, inviting venue that showcases historical artifacts and tells the story of the area through its use and inhabitants. Celebrate North Portland is an annual dinner and awards ceremony created to celebrate all of the awesome individuals, businesses, and organizations that make our corner of Portland such a great place to live and work. This event is driven by a group of dedicated community volunteers who serve on our planning team. Founded in 2011, this event brings together a diverse group of community members from all over the North Portland area. The main focus of the event is to honor the community members who have been selected to receive awards. However, this event also fosters opportunities for cross-neighborhood connections and networking.